It's been a great week here at Savannah Canoe and Kayak with lots action on all major fronts. 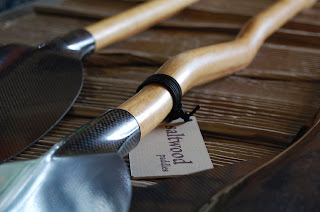 A new batch of Saltwood Paddles arrived at the shop, including the awesome bentwood Saltwood. This is a paddle to 'be hold' indeed. Combining traditional concepts with high tech construction, the Saltwood boys are really starting to find their groove. We are stoked to have these paddles on display in our shop. "How do they feel ?" you ask. Good question. Well, this is soul food...no prescription needed ! Talking of soulful wooden paddles, Lumpy GP's will be arriving at the shop in a couple of weeks to complete our fine selection of craftsman built canoe and kayak sticks. Saltwood, Lumpy and Whiskeyjack....come check out how a 'real' paddle should feel. Pat and Sharon from NSB, dropped in for a quick roll clinic. We worked on the Back Deck-Reverse Screw roll. Great trip to the swamp the other day with esteemed biologist John Crawford from the UGA Marine Extension Service on Skidaway. 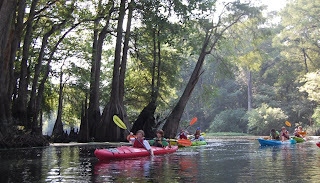 With 25 summer campers, we paddled silently thru gator infested waters looking at shrubs, bugs and birds. WOOOAH ! Actually, we were signing Lady Gaga songs and saying "Dude!" a lot. We have some great used composite kayaks on sale right now. The neo classic surfing sea kayak Island Quuarsut is a boat before it's time. Pretty much brand new, barely demoed, this boat rocks the waves better than most and is ready to go at $2175. An NDK Romany with ye old rope skeg is so hot in the waves it's "ORSM" as your grand mother likes to say. Yellow over white with foam back block going for a song at $1799. Tiderace, did you say ?...yes, we have a couple of demo and used Tiderace Kayaks ready to take you to another world. Call to schedule a demo. 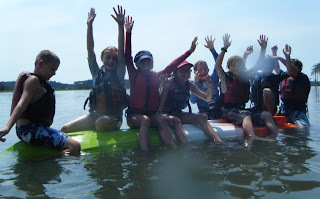 Well done to Guides Zac and Cindy for a smooth program with the Sea Sprouts Kayak Camp. It was once again, two great days of madness and organized mayhem on the water with kayaks. The Freshmen Sprouts played new games as well as a few of the old classics, like Muddy Buddie, Shaky Monkey and Women and Children first, Dude ! Are you ROFLMAO yet ? Lots of L1 & L2 kayak classes going on every weekend. Beginner Surf Kayak classes have been a big hit all summer long with conditions ranging from LAME to LOL to KMA. Once you have taken a surf class we have shred sleds to rent for your continued enjoyment and skill progression. So, come on ! lets get some before the tsunami ruins it for us all. Surfers for Autism will be having an event. This is an organization using surfing to reach out to autistic children and their families. For a day of fun in the surf and raise funds for research into autism... more information can be found at surfersforautism.org or on Facebook on their Surfers for Autism page. Kayak For A Cure....Diabetes that is. Saturday Aug 13th. 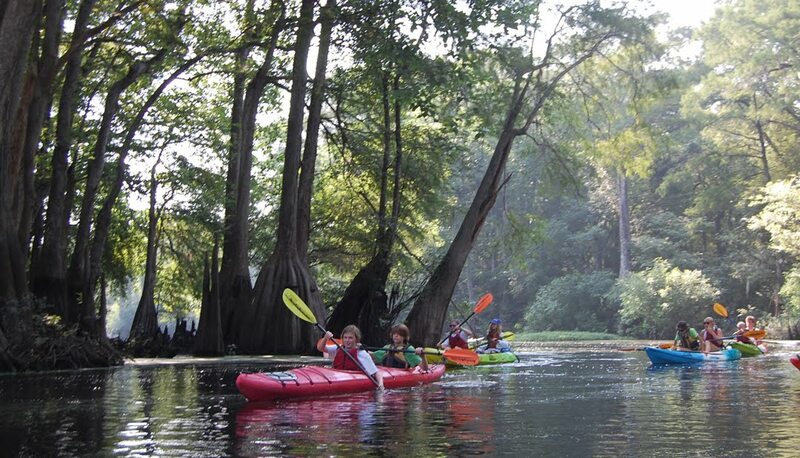 Come paddle the beautiful 3 mile stretch of the Skidaway River, From Butterbean Beach to the UGA Aquarium. Sign up is $50 and includes BBQ lunch, drink and music.Wow ! Interested in sailing your kayak or canoe ? This First Thursday Presentation at 6:30pm, July 7th, will be on Canoe and Kayak Sailing. Jim Farrelly, local avid boat builder and kayak enthusiast, will be 'showing and telling' his experiences with small boat sail rigs. 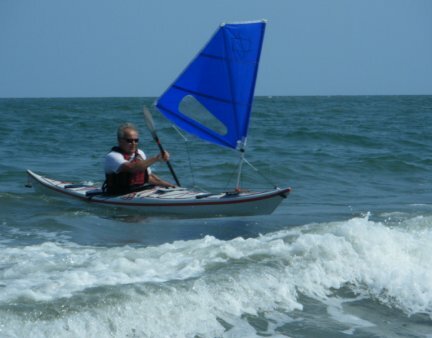 Water Tribe member and 5 time Everglades Challenge racer,Dan Lockwood will also be here putting in his 60 cents, along with his well traveled Klepper kayak sailing rig. We hope to have several different rigs set up for viewing and will arrange a demo session on the lake later this month. The presentations are free. We have a fridge ready to give and receive your favorite beverages. To get you in the mood, here is some good old fashioned, high speed, back river Nazi canoe sailing.... Bring it.